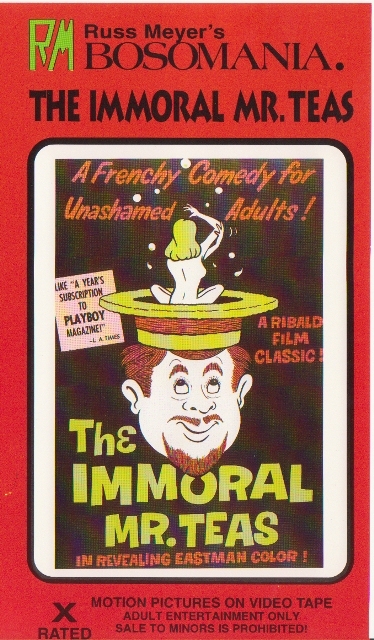 THE IMMORAL MR. TEAS...America's first classic skin-flick. Up until the late fifties, the only pleasures that the raincoat brigade, the salesmen killing a couple of hours, and the people generally interested in dirty movies had access to were films depicting nudist camps, French or Italian imports with a smattering of sexual content, and what might be described as "Early Forty-Second Street." Russ Meyer's THE IMMORAL MR. TEAS changed all that, for here was a film that dared to laugh at all the pretentiousness of its predecessors, and quite unabashedly for the first time depicted the living pinup, the mythical woman, the unblemished, unpimpled, unsweaty, hothouse fruit, which could never be fondled or touched, only looked at and dreamed about. Starring the comical BILL TEAS with his capacious corps of BOSOMY BEAUTIES...Ann Peters, Marilyn Westly, Dawn Dennelle, and Michele Roberts. THE IMMORAL MR. TEAS...the "real" man next door!